Time to kill and no place to go. It can be a dangerous thing. I had to check out of my hotel at noon, but I didn’t have to be to work until noon. I decided to hit up the Meridian Mall in Okemos. I thought maybe I could kill some time, but I was wrong. Mall’s don’t do anything for me. After I left the mall, I headed to Best Buy. Since it was the middle of the afternoon, I thought maybe I could actually play their display DJ Hero. I hung out with a pretty popular Chicago club DJ while I was in college and he taught me a little bit about mixing. I don’t want to buy DJ Hero, but I wanted to see how the game worked. It wasn’t all that fun, so I only played a couple songs then checked out some other Wii games. Scoped out some titles for myself and for my in-laws for Christmas. After I left Best Buy, I still had over an hour. I was a little hungry and not in the mood to go hunt something out. In the Best Buy parking lot was a Taco Bell and a Burger King. I picked the less of two evils. The Taco Bell on Trowbridge Road in East Lansing. Fast food is almost never my first choice, but when it is, there is one place J and I can usually agree on. This particular scenario came up Saturday morning. I was working at Spartan Stadium for the MSU spring football game. When it came time for lunch, J came to pick me up so I wouldn’t lose my parking spot. I was worried about rain and only had about 45 minutes by the time she got there, so I figured sitting down was out of the question. If the sky’s opened up, I wanted to get back in a hurry to get my gear covered and out of the elements. The night before, we debated between pizza and tacos for a late night run and pizza won out. Since we both had the taco craving, we headed for the border. Who would have thought Twitter was a good place to find stories. This was posted quite a while ago on the Lansing Taco Bell Twitter page. 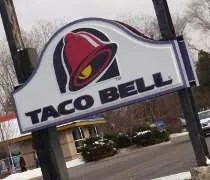 On April 23rd, ALL Lansing, Michigan Taco Bell will be giving 15% of their sales to Boys and Girls Club. Give for Graduation! Ah, Fourth Meal. My girlfriend came home from work and said she was hungry. What a coincidence because I’m always hungry. We debated for about ten minutes about where to go. There’s a White Castle, Tim Horton’s, and Taco Bell pretty close. For some reason, we both craved taco’s so Taco Bell won out. 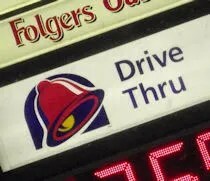 Like most fast food, it has been year’s since I’ve eaten at a Taco Bell. In Illinois, I always went to a chain called Taco John’s. Tuesday’s were Taco Tuesday where taco’s were half price, so that was about the only time I ate fast food taco’s. Anyway, back to Fourth Meal. It was after midnight so only the drive-thru was open so we got in line. Taco Bell is a pretty popular place that late at night. There were probably five or six cars in front of us, but the people working inside were pretty efficient in getting people through the line. We didn’t sit in line more than five minutes before ordering. I stuck to something simple and just got four hardshell tacos. Like most places, the tacos are really simple with just beef, lettuce, and cheese in the shell. 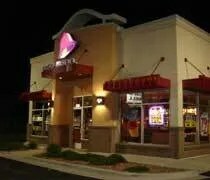 I’ve always thought Taco Bell’s tacos were a little dry and that’s why I don’t usually go. These were that way too, but it really hit the spot that late at night. My girlfriend got a softshell taco, a small nacho, and a Strawberry-Mango Fruitista Freeze. The softshell taco was just like mine….but with a softshell. The nachos are just…well, nachos. The chips came with a cup of cheese on the side. The Fruitista Freeze are kinda like a fruit smoothie. All the advertisements show a mango smoothie with a layer of strawberries on top. What she actually got was a mango smoothie with a dollop of strawberry on top. Taco Bell served it’s purpose. We didn’t order enough food beause we were both still hungry, but that late at night do you really want a big meal? 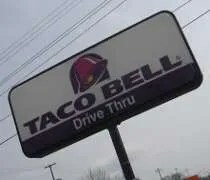 Since there are no Taco John’s that I know of in the Lansing area, I’m sure we’ll hit Taco Bell more often. Again, not my first choice, but it’s not horrible either. It’s one of those “you know what you’re gonna get” places and that’s not always a bad thing.